Our puppies all come litter box trained. We take the time to keep our puppies longer to help our families out in the Potty training process. Puppies are not ready to go outside and are NOT full vaccinated until they are 16v weeks old. Puppies should not be out in public areas until they are fully vaccinated. Above you can see how our puppies are set up. There is a new invention that many of our puppy parents are RAVING about. It is called the puppy apartment. You can view it at www.modernpuppies.com. It is the exact same set up as our puppies are used to. We recommend ordering the medium size JUST BECAUSE I LIKE MY PUPPIES AND DOGS to have alot of room. But you can get the small and be just fine. This tiny little girl who only weighs 5 lbs and not even a year old in the video can already do an agiltiy course!!! Great Job Joe! Shorkie puppies are very eager to learn and to please. 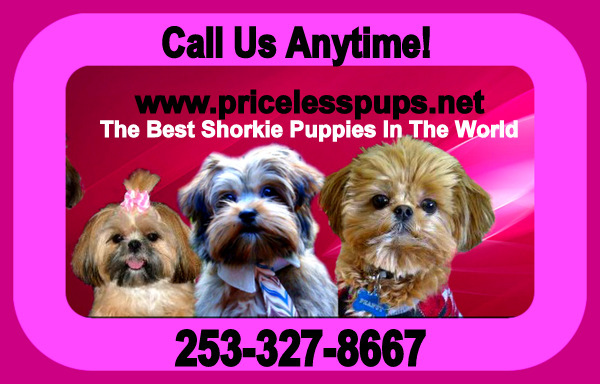 Our Shorkies are simply AMAZING!! !